Outstanding student debt grew rapidly in the years following the great recession, as greater numbers of students enrolled in college and borrowed more. Rising college prices surely contributed to that trend, too. Because the bulk of that debt is issued through the federal student loan program, policymakers often respond with proposals to cut the interest rate the government charges. Unfortunately, those proposals hardly change the college access equation—the benefits borrowers receive are trickled out one month at time over decades-long repayment terms after they’ve left school. That point is lost on many lawmakers and presidential candidates, even those who have otherwise put in the time and effort to develop a higher education platform, such as Hillary Clinton. Notice that Clinton singled out undergraduates. She did not mention the other two categories of federal loans, those for graduate students and parents of undergraduates. [ii] To be sure, the document mentions cutting rates on all types of student loans issued in the past and still outstanding, but going forward she is targeting undergraduate loans. One can imagine her reasoning. Cutting interest rates is an expensive policy, forcing lawmakers to make up for the lower profits that result with tax increases, program cuts, or deficit spending. How can the expense be kept in check? Don’t cut rates for borrowers with graduate degrees given that they go on to earn high incomes and federal aid is supposed to be about access to college, not completion of advanced degrees. Don’t cut rates on parent loans because the benefit would go to families with the average household income of $86,381 in 2012, well above the national median. [iii] That leaves cuts on loans to undergraduates on the table, with the presumption that targeting that category of borrowers serves those most in need, advances the federal goal of college access, and reduces government costs compared to reducing rates for everyone. There are other reasons why undergraduate loans show a cost to the government and the others show a profit using the official estimates. Undergraduates are about three times more likely to default than graduate students or parents, and a subset of undergraduate loans are interest-free during in-school periods and other situations, while all graduate and parent loans accrue interest from day one. [vii] Parent loans are also ineligible for the most generous income-based repayment plans. Specifically, the latest official numbers from the CBO reveal that the next ten cohorts of undergraduate loans will cost $19.6 billion. In contrast, the graduate and parent loans will earn $72.9 billion. The nearby table shows the components of that calculation, but some further explanation is helpful. The government measures the cost of a loan on a discounted present value basis, meaning it shows the lifetime cost as a lump sum in the year it is made. That is different than grant programs, where costs equal the amount of money that leaves the treasury in a given year. The present value approach better reflects what happens over the life of the loan all at once, when the government issues it. The CBO reports the present-value costs as “subsidy rates.” A $1,000 loan with a present-value cost of $100 has a subsidy rate of 10 percent. A $1,000 loan that earns the government $100 has a subsidy rate of negative 10 percent. Looking at the latest CBO estimate we can determine the cost of undergraduate, graduate, and parent loans by multiplying the volume of loans in each category by the corresponding subsidy rate, plus the cost to service the loans. [viii] Thus $550.9 billion in undergraduate loans that the government will issue over the next ten years, multiplied by the combined subsidy rate and administrative cost of 3.6 percent, shows that those loans will cost $19.6 billion. Loans to graduates and parents, on the other hand, show a negative subsidy rate of 13.2 percent after administrative costs are added in, meaning the loans are profitable. The government will issue $553.0 billion of those loans over the next 10 years, netting the government $72.9 billion. Combine all the loans and the overall program appears profitable but hides the fact that undergraduate loans are not. Given that Clinton’s rationale for cutting interest rates rested on the erroneous claim that the government earns a profit on undergraduate loans, how might she modify the proposal? To be consistent with her rationale of eliminating government profits, Clinton could propose rate cuts for future graduate students and parent loans instead, but that’s not really a “college” affordability policy if it mostly helps graduate students, nor is it targeted at low-income families putting kids through college given the profile of parent borrowers. Clinton’s rationale for rate cuts puts her in an even more awkward spot when you consider this dynamic: Recall that graduate and parent loans default at one-third the rate of undergraduate loans, and parent loans do not qualify for the most generous income-based repayment plans. They are, in other words, less risky for the government. To cut the interest rate enough to eliminate government profits on graduate and parent loans then, her policy would end up charging those borrowers lower interest rates than undergraduates—the exact opposite of current policy and a regressive distribution of benefits to boot. Then there is the issue of CBO’s fair-value estimates. The agency has effectively disavowed the accounting rules that all but require it to show the federal loan program makes a profit. It prefers fair-value estimates, which include a broader measure of risk, are “more comprehensive” and don’t show a profit. [ix] CBO now regularly includes those estimates alongside the official ones it says are flawed. More tough facts Clinton has to ignore as she presses for interest rate cuts. A better approach than what Clinton has outlined would be to eliminate interest altogether under a broader reworking of the student loan program. Ironically, the existing income-based repayment program, which Clinton wants to expand, comes close to doing that now. Payments are based on income, not interest rates and loan balances, although those factors affect the length of time and total amount a borrower pays. Moving to an entirely income-based repayment plan is a better way to promote college access and lower loan burdens than Clinton’s plan to target interest rate cuts to undergraduates. The Bush plan does not charge interest, so there is no need to set different rates based on the type of borrower. Repayment amounts would track a borrower’s income from the start. There would be few if any defaults because repayment would occur through income tax withholding. Collection and administrative costs would plummet. And the program could be budget neutral if that is the desired federal policy. [i] Congressional Budget Office, “March 2015 Baseline Projections for the Student Loan Program,”, March 2015, https://www.cbo.gov/sites/default/files/51310-2016-03-StudentLoan.pdf. [ii] There are five categories of loans. Two categories are for undergraduates: Subsidized Stafford loans and Unsubsidized Stafford loans. Two categories are for graduate students: Unsubsidized Stafford loans and Grad PLUS loans. One category is for parents of undergraduate students, the Parent PLUS program. This analysis combines the two undergraduate loans into one category and the other loans into another category. See https://studentaid.ed.gov/sa/types/loans. [iii] Median income of Parent PLUS loan borrower in 2012 was $75,996. National Postsecondary Student Aid Study 2011-12. [iv] Annual percentage rate calculated using a 10-year repayment term. Longer terms will result in a slightly lower APR. [v] Undergraduate Stafford loans (Subsidized and Unsubsidized) carry an interest rate of 4.29 percent and a 1.07 percent origination fee in the 2015-16 academic year, which translates into an annual percentage rate of 4.65 percent over a 10-year repayment term. Graduate Stafford loans carry a 5.84 percent interest rate and a 1.07 percent origination fee (APR of 6.21 percent). Graduate PLUS loans carry an interest rate of 6.84 percent and a 4.27 percent origination fee (APR of 7.79 percent). Parent PLUS loans carry an interest rate of 6.84 percent and a 4.27 percent origination fee (APR of 7.79 percent). The weighted average APR for the two graduate loans categories is 6.62 percent. See https://studentaid.ed.gov/sa/types/loans/interest-rates. [vi] Fair-Value Estimates of the Cost of Selected Federal Credit Programs for 2015 to 2024 (Washington, DC: Congressional Budget Office, May 2014), https://www.cbo.gov/sites/default/files/113th-congress-2013-2014/reports/45383-FairValue.pdf. 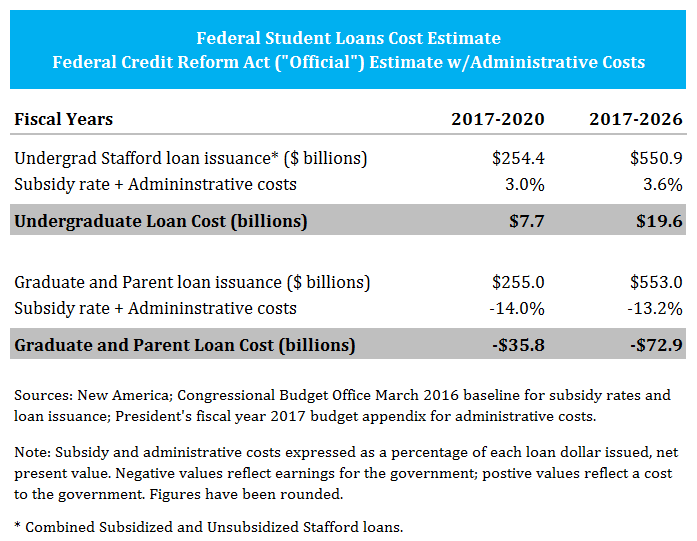 [vii] U.S. Department of Education, Fiscal Year 2017 Congressional Budget Justifications, Student Loans Overview, http://www2.ed.gov/about/overview/budget/budget17/justifications/q-sloverview.pdf. [viii] The government also reports what it costs on average to service the loans (i.e. the administrative costs of disbursing, tracking and collecting on the loans). But for an arcane set of reasons, those costs are reported separate from the subsidy rates and the CBO does not calculate them on a present-value basis. The U.S. Department of Education, however, does report the average cost of loan servicing on a present-value basis as 1.70 percent. This analysis adds that figure to the subsidy rates the Congressional Budget Office reports to calculate the total cost of the loan program. Budget of the United State Government, Fiscal Year 2017, Appendix, U.S. Department of Education, https://www.whitehouse.gov/sites/default/files/omb/budget/fy2017/assets/edu.pdf. [ix] Only the Parent PLUS loan program is profitable under CBO’s 10-year fair-value estimates published in 2016. It is the smallest of the four loan programs. All loans for graduate and undergraduate students show a cost under those fair-value estimates. See https://www.cbo.gov/sites/default/files/51310-2016-03-StudentLoan.pdf. [x] Michael Stratford, “Bush Pushes Loan Overhaul,” Inside Higher Ed, January 20, 2016. https://www.insidehighered.com/news/2016/01/20/jeb-bush-unveils-higher-education-plan-focus-federal-loan-overhaul. [xi] Jason Delisle served the Jeb Bush campaign as an informal advisor on higher education policy. [xii] Borrowers could fulfill their repayment obligations early once they repaid 1.75 times the amount they used to finance their educations. This creates a similar effect to repaying a loan balance with interest. Borrowers could use up to $50,000 to finance their educations. For every $10,000 that they used they would then repay 1 percent of income for 25 years.